The Waterbase Limited is committed to understand and meet the customer needs and expectations by implementing code of Good Manufacturing Practices and Standard Sanitation Operating Procedure. Experienced skilled and qualified staff processes the raw Material under strict hygienic conditions, backed-up and monitored by qualified Quality Control personnel to ensure high product quality and to minimize the risk of microbiological contamination. 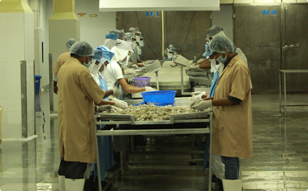 The company process and delivers quality Frozen Shrimp products meeting all statutory requirements which provide the best value for money. 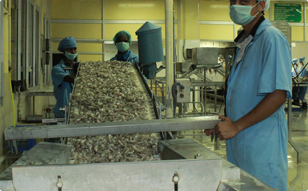 The Company's Shrimp Processing Unit combines cutting-edge technology, state-of-the-art storage facilities and ultra-modern logistics capabilities to ensure timely delivery. The Unit operates in compliance with EU, USFDA, HACCP, FSSAI & BAP global standards. The shrimps processed at our facility are marketed in different forms to quality conscious markets of Japan, USA and Europe. Grading machine for size grading from CHINA. Plate freezers from APV-BAKER, UK. 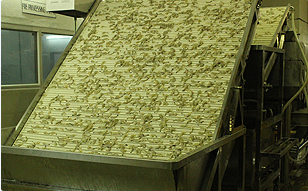 Cooking/ Blanching lines from FRIGOSCANDIA – SEAMAC lines, DENMARK. IQF machine from KOPPENS, HOLLAND. Flake Ice Machine using technology from NORTH STAR. Palletized Cold Storage facility capable of storing 650 MT of Finished products at -18° C below. Quality Control Lab equipped with sophisticated equipment’s to cover entire range of Microbiological, Biochemical test including assessment of residual Antibiotic substances. Low temperature refrigeration equipment’s from SABROE, DENMARK. Water purification system using Chlorine dozing for different uses, ultra violet treatment of water at strategic points. Well equipped with Effluent Treatment. Waterbase is a supplier of superior Quality of Vannamei Shrimps in Raw, Blanched, Cooked, Breaded & Battered and other Value Added Seafood products to overseas buyers. The products are packed in attractive pouches, duplex and strong corrugated boxes to ensure safe handling at any destination. Frozen Head-on Shell on Vannamei Shrimps. Frozen Headless Shell on Vannamei Shrimps. Frozen Raw Peeled & Deveined Tail-on Shrimps. Frozen Raw Peeled & Deveined Tail-off Shrimps. Frozen Raw Peeled Pulled Deveined Shrimps. Frozen Raw Peeled Un-Deveined Shrimps. Frozen Raw Headless Ez-Peel Shrimps. Frozen Cooked Peeled Deveined Tail-on Shrimps. Frozen Cooked Peeled Deveined Tail-off Shrimps. Frozen Blanched Peeled Un-Deveined Shrimps. Frozen Blanched Peeled Deveined Tail-off Shrimps.